BOR-GO® mobile app enables your employees to clock-in/out location data even in an offline environment. Also, employees can check their clock-in/out history. All versions of employee handbook are stored in the app so your employees review any important company policies anytime. Also, every time a new employee handbook is release, employees are asked to read and sign the handbook to use the app, which assures all employees acknowledges updates in policies. Employees can see the summary of payrolls and download paystubs and W-2 forms. BOR-GO® mobile app tracks available and used PTO/Sick hours. Employees can request paid time-off, sick leave and personal time-off (unpaid) through the app. Employees get notified as soon as a request is approved or declined. Employees can check their work schedule 24/7. Any schedule changes are immediately updates and your employees get notified the changes. You can send various notifications to your employees such as; clock-in/out reminder, updates on work schedule, companywide/individual communication message and more. overtime, Paid-time-off, vacation, and tax withholding. printable checks and/or direct deposits*. employees in all 50 states. Process payments for 1099, independent contractors. Clock-in/out from anywhere and on any device, with location data. Clock-in reminder and auto clock-out features in case your employees forget to clock-in/out. Easy online approval for employers. Synchronize with our payroll function to import accurate work hour data. 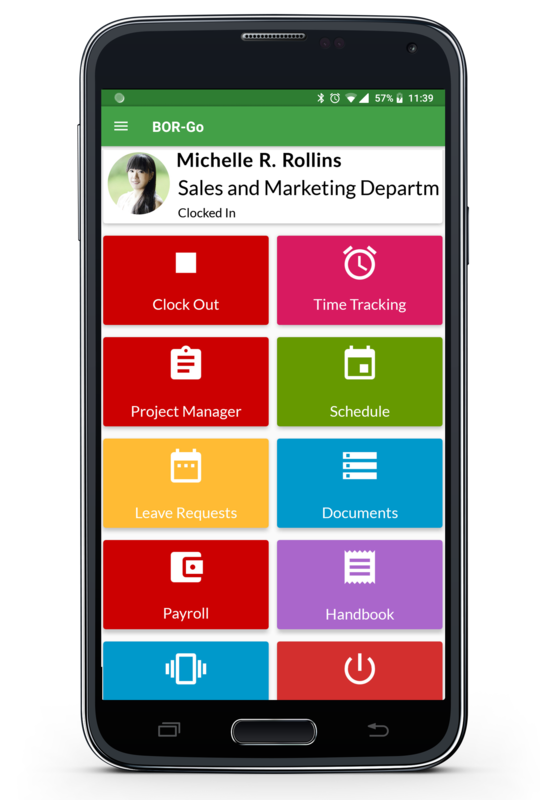 Easy to manage scheduling system for employers, with employee view only access. Hours, payroll summary reports, tax forms, time-off, EEO reports and more reports available to download. Create customized job application forms for opening positions. Accept applications including resume submission online. Securely store all submitted application forms and resumes. Past applicants could be qualified candidates for other positions. Employee access to pay stubs and W-2 forms. Manage all employees’ information and forms in one place; timecards, employment forms, performance reviews, compensation history, licenses, vocational certificates and personal information. Store and organize all company documents and legally required forms. Download at your convenience. Request your employee fill out and submit documents through BOR-GO®. Reminder to helps you keep all important documents up-to-date. Create projects and assign employees. Assigned employees get notified by email and/or SMS once a project is created. Employees can check assigned project from anywhere; online and on their phone. View all projects at a glance by month, week or day. Send messages to the entire company, by department(s) or to individual employee(s) via Email and SMS.